Plastic, 60 lumens. Lightweight, durable and portable. Touching a finger to the top of the light turns it on and off. 3 "C" batteries (not included). Plastic, 60 lumens. Lightweight, durable and portable. Touching a finger to the top of the light turns it on and off. 3 "C" batteries (not included). Plastic, 60 lumens. Lightweight, durable and portable. Touching a finger to the top of the light turns it on and off. 3 "C" batteries (not included). Nightlight, dual mode, motion or on/off. Hook on top allows it to be hung or carried. 48 lumens, uses 4 C batteries (not included). Touch top operation. 100 lumens, 3 AA batteries (not included). 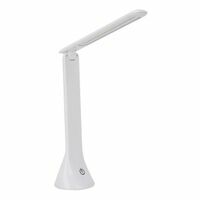 Operates on a touch-activated, three-stage dimmer for varying levels of brightness.